True confession time: I don't enjoy Doctor Strange stories. I just can't get into the character and the mystical mythos surrounding him only confuses and irritates me. 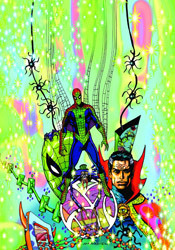 Which means the question indirectly posed in this series by jack-of-all-trades Brendan McCarthy is: can Spider-Man temper my disdain for Strange enough to get us all through a mini-series relatively unscathed? McCarthy's quirky storytelling might take a bit of getting used to, but it also excuses several of Strange's eccentricities. He belongs in this kind of wide-eyed, whimsical atmosphere, filled with spontaneously exploding books and a hearty helping of magical special effects. The whole issue reads like some kind of tripped-out voyage into the psychedelic sixties, when colors were bright, spirits were ponderous and dialog was only there to explain what the hell was supposed to be going on. Either Strange has a blind invisible friend chilling in the room with him at every moment or he really enjoys muttering the obvious to himself underneath his breath. Yet for all the little bits and pieces that should have annoyed me to no end, I actually found this issue to be strangely charming, no pun intended. There's a certain innocence and honesty to this brand of fantasy, one that had me often flashing back to the classic, outrageous tales of Amazing Spider-Man's early chapters. That's most apparent during the half-issue that focuses directly on Spidey, of course, but it's there during the Strange narrative too, whenever the Doc manages to shut his mouth long enough for it to surface. Brendan has an interesting spin on the “real” world, for all three pages in which this story resides there, but once the direction takes a turn for the mystical, his style is completely submersive. It's a good thing McCarthy handles the visuals himself, because I'm not really sure how he'd direct another to bring some of these concepts to life. His pages are something else, with panels bleeding into one another, splash pages telling three or four stories within a single composition and hidden symbology thrown into every empty space. Navigating his visuals is often a cloudy, uncertain experience, like trying to make sense of a dream after a night of heavy drug abuse. It would be utterly frustrating if it didn't fit the fevered tone of the story so very well. If you're after something with a lot of substance, this isn't your ticket. It's a pleasure cruise through the screwy subconscious of the writer, and while it's often overwhelmingly imaginative, it's also fairly vaporous. Spider-Man Fever won't change your perception of the characters or alter their personalities in the long-term, but it will keep you entertained, dare I say captivated, from start to finish. It's utterly trippy, bending the reader's mind in unexpected ways and sometimes babbling incoherently, but the main narration remains surprisingly lucid. I shouldn't have liked this nearly as much as I did. Borrow it.